It’s been quite a while since I sewed for myself, so I feel the need to put a bit of a preface on this post. I’m not a beautiful seamstress, I’m a functional seamstress. People who don’t sew compliment me on the things I make, but I shy away from showing any experienced seamstress my seams, zips and hems. Why am I telling you this? Because I wanted to make it clear from the start that this isn’t a garment blog, nor do I have intention of it morphing into one, but I’d like to share what I’ve made faults and all. Which brings us to Simplicity 2451. 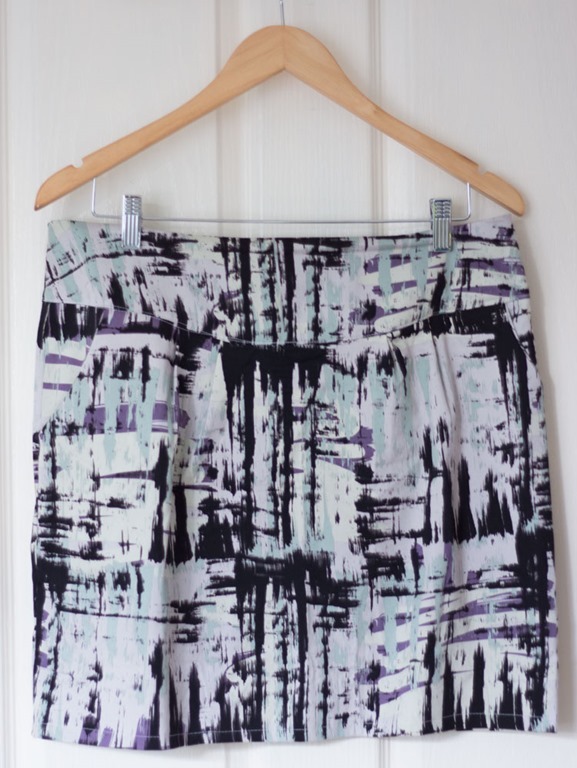 This has been a really popular skirt to sew in blogging land, and while dubious about the style on my shape, decided to go ahead and purchase the pattern and some fabric. I went with a cotton sateen with a print that was/is a little out of my comfort zone in an attempt to brighten up my wardrobe. I traced out the pattern, cut out the pieces, pinned them to my mannequin, and realised there was no way it was going to fit me. The ‘bit’ of weight I’d put on, had pushed me up an entire size. Fast forward a year, and I’ve lost that ‘bit’ of weight plus a little more and decided to pull it out again and sew it up. My intent was to make a wearable muslin and that’s exactly what I’ve got. Before adding the waistband the skirt looked too large, but when it came to the waistband it looked too small. Sigh. I decided to omit the interfacing to allow the sateen to stretch once on. This was an error on my part as it did fit after finishing it, and because there is no interfacing it now stretches out and becomes loose! Oh well! This pattern has some fun features that first drew me to it; I love the pockets, the curved yoke, and the little front pleats which are small enough to be flattering rather than billowing out and emphasising my stomach. I’m going to make another one of these, possibly in a light corduroy or light weight denim.